Hi! Today I'm getting my Christmas spirit on! It's not that far away and I want to be ready. 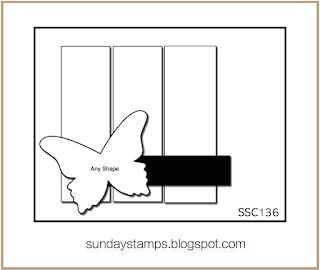 For inspiration, I'm using the sketch from the folks at Sunday Stamps. Here's my card. Does it have you singing about Rudolph? Rudolph and the sentiment are from The Cookie Cutter Christmas Stamp Set, Rudolph is punched out with the Cookie Cutter Builder Punch. 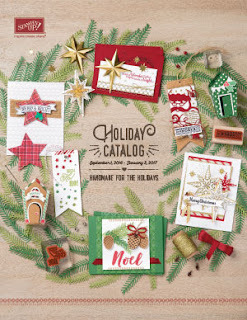 Dig out those Christmas tunes and have fun stampin'! Hi there! I'm working on using the rest of my Halloween Night Specialty DSP. I only have a few sheets left. One of them is the cute page with the pumpkins and polka dots. This piece speaks Fall to me rather than Halloween, so that's the direction I went. I used my DSP for the large banner in the card center. I die cut my Swirly out of Pumpkin Pie using the Swirly Scribbles Thinlets Dies. I backed my Swirly with some gold Baker's Twine from the Baker's Twine Trio Pack. I unthreaded the ends before adhering it to my banner. I stamped the scarecrow from the Halloween Cookie-Cutter Stamp Set in VersaMark and then Crushed Curry. I embossed the little guy with clear embossing powder. I colored him with Stampin' Write Markers. 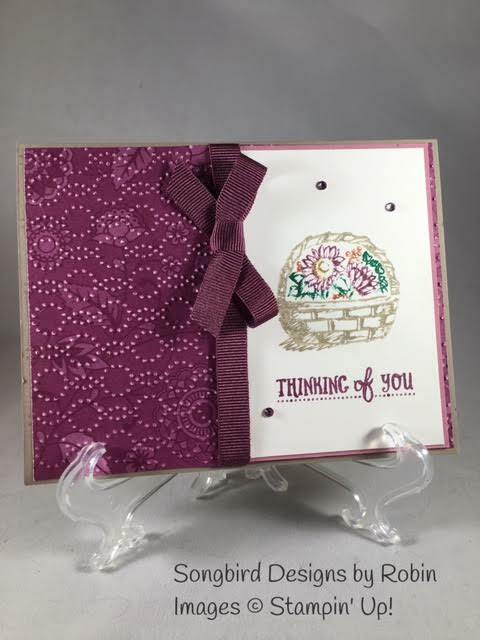 The sentiment is stamped and cut out using the Labeler Alphabet Stamp Set. Hello! I hope you had fun on the Inking Royalty Halloween Hop. If you haven't hopped yet, it's not too late! This is my second post of the day. 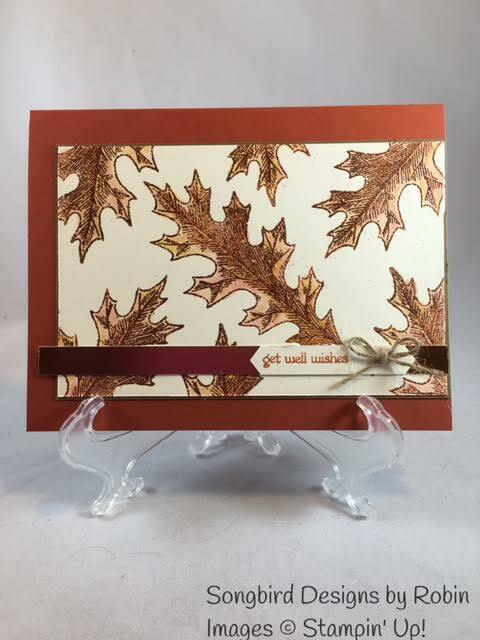 I'm so into the Vintage Leaves set that I just can't seem to leave it alone, I'm using this set again to make a card for the FMS255 Challenge. I stamped my chosen leaf (I think it's an Oak leaf) all over my card front in Cajun Craze. I then embossed it in copper. 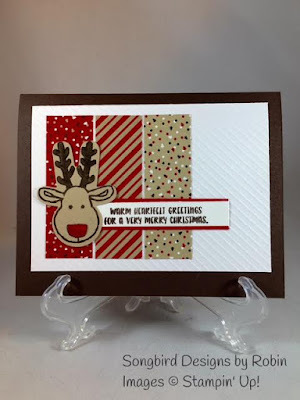 Using a Blender Pen, I lightly went over the embossing with Cajun Craze and Delightful Dijon inks. I added a copper foil strip to match the sketch. My sentiment is from Teeny Tiny Wishes. I stamped it in Cajun Craze and punched it out with the Classic Label Punch. 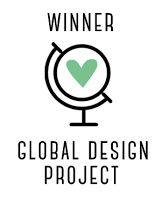 A tiny bow finishes off my design. Leaves similar to the ones on my card are starting to turn on the trees in my neighborhood. How about your places? Are they turning where you live? Welcome to InKing Royalty's September Blog Hop! 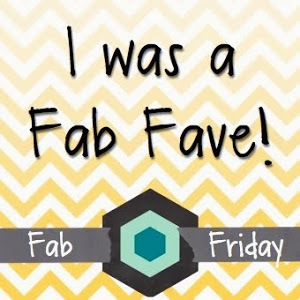 We are excited to share some super-fun creations with you today! 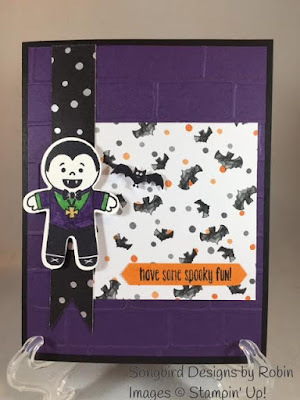 This month's Blog Hop is filled with inspiring projects that feature each artist's take on the spookiest time of year - Halloween. What fun! After you read my post, I hope you'll hop over to the next person on the list at the base of this post. 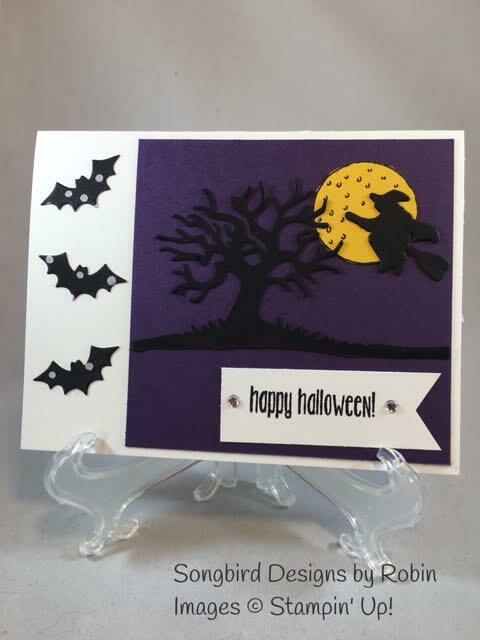 My first project is a Triple Stamp Card using the stamp set Spooky Fun. 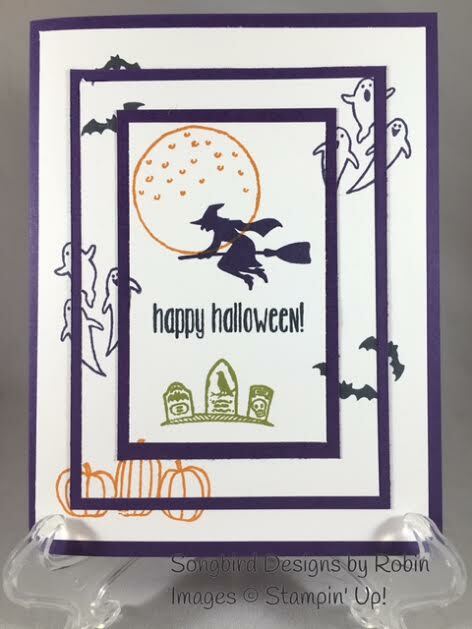 Take a look at all the spooktacular images on this fun card. 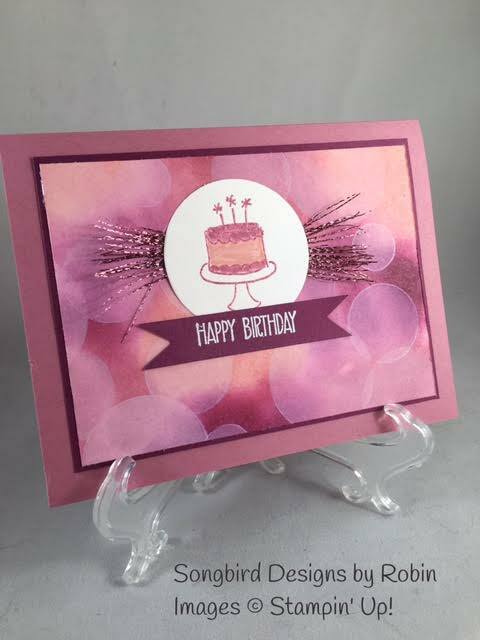 The card base and cardstock layers are Elegant Eggplant. Purples are my favorite colors and I love using them at Halloween time. The other colors I used are Basic Black, Tangerine Tango, and Old Olive. For my next project, I pulled out my Mini Treat Bag Thinlets to make a fun little bag large enough to hold a Kit Kat Bar. 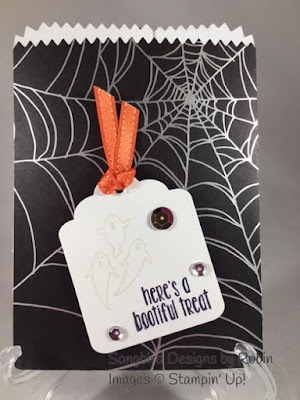 The Designer Series Paper I used for the bag is from the Halloween Night Specialty Designer Series Paper. This spider web piece worked perfectly for the front of my bag! 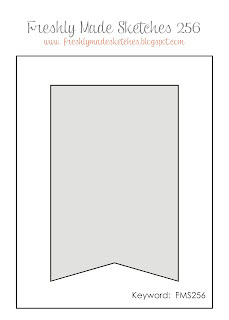 The tag is die cut using the Tags and Labels Framelets. The stamps are from the same Spooky Fun Stamp Set as my card above. The ghosts are a little hard to see during the daytime but look great at night because I used glow-in-the-dark embossing powder! Some sequins and Tangerine Tango ribbon finish off the tag. Thank you for stopping by today. I hope you'll hop along to the next stop on the blog hop Brian King at http://stampwithbrian.com/ There's lots of inspiration to be found in this group - and you don't want to miss it! Hello! It's been a l-o-n-g time in between posts! Sorry about that. I have started back to school and it took awhile to settle back into my school year routine. I sure miss those long days in my studio during the summer! 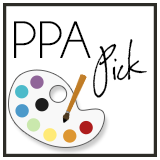 Here's the PPA banner that was my inspiration. Beth Beard came up with this sketch. I think it has lots of possibilities. You should give it a try! The vampire is from the Cookie-Cutter Haloween Stamp Set. I colored him using Elegant Eggplant and Cucumber Crush markers. His cross was colored with a gold Wink of Stella Pen. 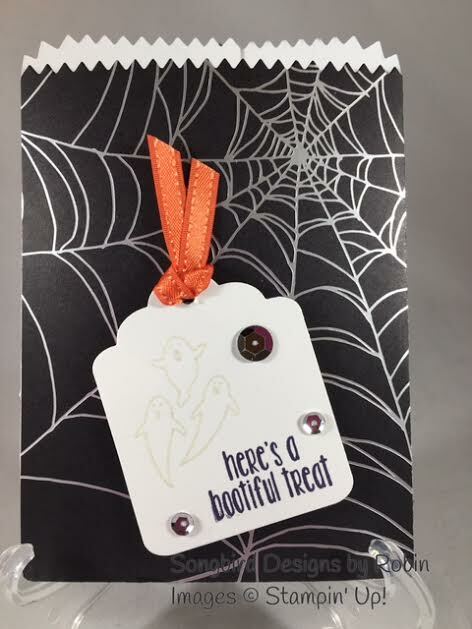 The DSP pieces are from the Halloween Night Specialty Designer Series Paper Pack. The sentiment is from the Spooky Fun Stamp Set. 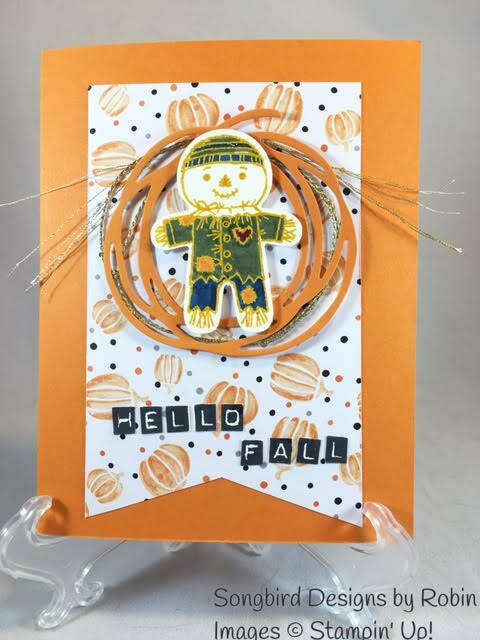 I stamped it on Pumpkin Pie cardstock and punched it out using the Classic Label Punch. And here is Teneale's card that I CASEd. Teneale's card is a baby card. I don't need one at the moment so I chose to CASE her sketch instead. 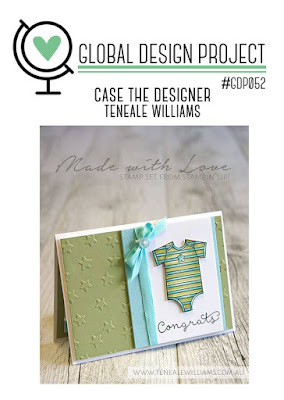 The left side of Teneale's card is embossed. Mine is too, but I embossed a piece of DSP from the Petals and Paisley's Specialty Designer Series Paper. The stamp set I used for my card is the Basket of Wishes Stamp Set. Like Teneale's sketch, I added a bow to my card. I used some of the yummy Rich Razzleberry ribbon from the Ribbon Trio Pack. 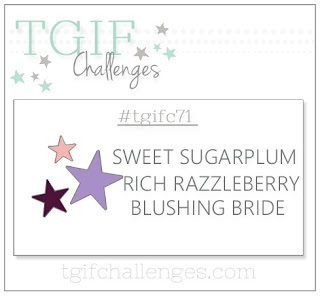 A few rhinestones colored to match the Rich Razzleberry color were added for a final touch. 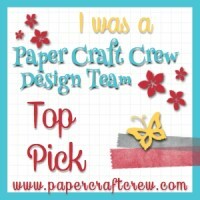 Have you ever had a cardmaking goose bumpy moment? Tell me about it in the comments below. 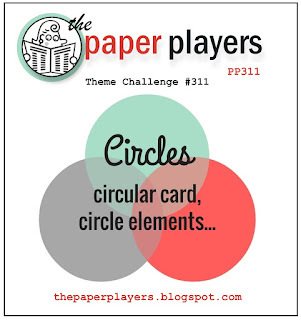 I decided a Bokeh card would be perfect for the circle challenge. I love the way it turned out with the color combo from TGIF! The cute little birthday cake is from the stamp set Endless Wishes. For a little bling, I used some of the Sweet Sugarplum Ribbon from the Glitter Ribbon Combo Pack. I unraveled the ribbon and tucked it behind the cute cake. Can't wait to put this beauty in the mail! 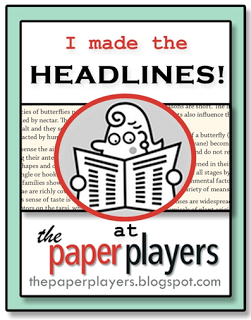 Patti MacLeith has a fun sketch this week over at the Pals Paper Arts Challenge. I just had to play along! This card uses products from the fabulous Holiday Catalog. You can order these products starting today! VERY exciting! As you can see, I stayed true to the original sketch. I used Thick Whisper White Cardstock for my base. The square is Elegant Eggplant and the moon is Crushed Curry. The stamp set is Spooky Fun and is on page 52 in the catalog. You can make many cute projects from this one little set! The awesome Halloween scene on my card is cut using the Halloween Scenes Edgelits Dies.They can be purchased as a bundle along with the stamp set to save 10%! The polka dotted bats are die cuts too. 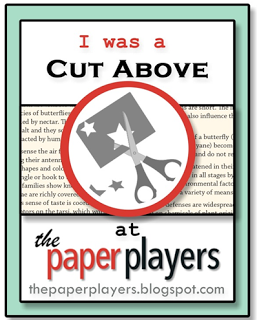 They are cut from a sheet of the Halloween Night Specialty Designer Series Paper Pack. 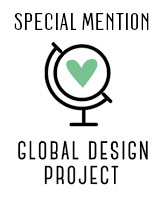 There are 12 designs in this pack on page 51. You can also order your September Online Card Class beginning today! These kits will come with everything you need to make 4 fantastic cards except for stamps, ink, and adhesive. (You can purchase these at my online store robinmyren.stampinup.net) The dies cuts, papers and cardstock cut to size, embellishments, and PDF direction will all be in the kit. I will even have the bows tied for you! You won't want to miss out on this fun opportunity! 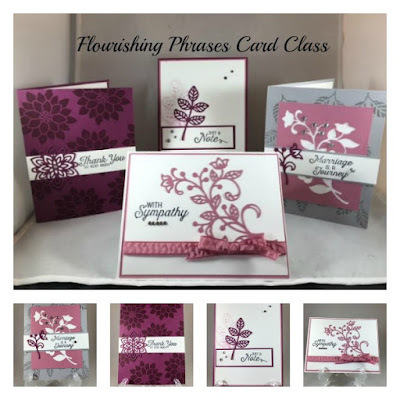 Kit with Flourishing Phrases Stamp Set - $15 when you order the stamp set from me using the host code ABKEWSEQ. Kit with the Flourishing Phrases Stamp Set/Flourish Thinlets Dies Bundle - FREE when you order the bundle from me using the host code ABKEWSEQ. 2. Request the September Card Kit. 3. Tell me which option you are purchasing. 4. Give me your email and mailing address. 6. When I see the funds in my account, I'll mail out your kit. It's that easy! I hope you'll give this fun class a try!